Ravenna Township is a civil township of Muskegon County in the U.S. state of Michigan. As of the 2000 census, the township population was 2,856. The village of Ravenna is located within the township. The township flag is shown on local government website: www.ravennami.com/township/index.html. 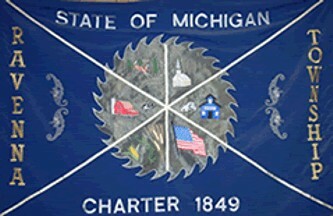 The flag is blue, a large saw blade in center with various local landmarks pictured on it. Overlying it a very thin white saltire.